What a silly name. Silly but catchy. Have you been to one? I've found that they're hit-or-miss. One visit I'll have a moist and luscious and flavorful burger (I usually go for the turkey burger), and the next, I'll be served a dry hunk of yuck (not worthy of being called a burger at all). However, as far as burger chains go, one of my qualifying standards is that they have a pepperjack cheese option. Fuddrucker's is one of the few that does, so I can't stay mad. Other good aspects? They toast the bun and have a toppings bar with all the lettuce, tomatoes, and jalapeno peppers anyone could ever want. Oh, and they have brown mustard, which is also an important part of my ideal burger. Yep, my dry-burger rage has completely fizzled out now. Meanwhile, some of you asked about the brand of mandoline that I used for my sweet potater chips. It's an Orka, which is apparently an extremely obscure brand--they don't even have a website. Mambalaya got it for $20 at TJ Maxx, and yes, it's a little rickety, but so far I have zero complaints. Reminder: You have one more week to send me your cinnamon goodness. I haven't received a lot of entries, but the ones I've gotten have been stellar. Keep 'em coming! I've never been to Fudrucker's! I'll have to bring my gf buns ;). Oh, I have my entry...I'll post it this evening or in the morning, I made it this weekend, I've just been too lazy to post! For a party I threw years ago, I set up a 'fixings' bar for burgers. Someone at the party commented that it was just like Fuddruckers. I took that as a high compliment! Brown mustard is definitely a must. No such animal around these parts. But I have heard good things about them. A topping bar? A place where I can have as many pickles & hots as I want? Yeah baby! I had one bad experience at a Fuddruckers back in TX and I've never given them another shot. We do have one here in CA now very close to our house. Maybe it's time I give them another try! I do love a toasted bun on a burger. My 'burger lovin' 15 year old son would love it if I took him there! Everyone goes nuts for In 'N' Out Burger here in CA, and trust me, they are overrated. Thanks for the post. If there was any guarantee that our burger would look like your photo, I'd be there today! We had a Fuddruckers in Tampa when I was really young and I remember loving it! That and Checkers. Yumm...you are giving me red meat cravings and it's not even noon yet! That condiment bar is freaking awesome! I'm going to have to go back to try one of their burgers at this point. I've never been to Fudruckers Grace but boy love that name! I loved Fuddrucker's in high school (esp their homemade rolls). The location near me isn't quite as good as I'd remembered. I do appreciate the condiment bar! Ah the fudd's! I am with you- hit or miss, mostly miss. When they first opened they were a hit in our town. Loved the grilled buttery buns but I think they have gone downhill in the last 20 years. We have five guys here which is popular but I really like Red Robin's burgers, very juicy! LOL having no Fuddruckers near me I thought you were swearing about a kitchen related mishap! I've never heard of this place, it sounds pretty nice though! I had a few bad experiences at the Fud myself, and I get really peeved at a bad burger. So, best to avoid situations that make one peeved, no? I've been MIA for awhile and have missed reading your adventures! Thinking I may just turn in a dish for the cinnamon adveture/contest you have goin' on! I won't tell you what my husband calls it. (Not so nice... Men.) I haven't been there in so long - not since college, I don't think. Um, turducken... yah know, to add to your list. Same mandolin I got. It's a smashing mandolin for the price. DOes the job and I have no complaints either! Never heard of that place before. We don't have this resto in Canada. mmmm.I love Fudruckers. their bund are out of this world! I went to one once. It was really tasty but they were so far away, I never went back. OMG I haven't been to Fudd rucks in so long, geez now you have me all dreamy of going...I haven't seen one in California in a long time...I wonder if they are still here. 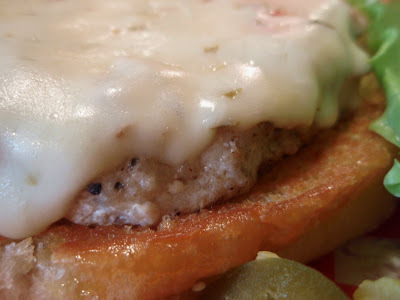 I have never been to this place.This burger in your picture though looks mighty tasty with the oozing cheese. "Firkin" pubs..."fox & firkin", fiddle & firkin, etc. Their motto is "come and have a firkin time"...you know you wanna say it...F-in! All I know is that several years ago, a friend's wife had a Fuddrucker's T shirt that said, "You ain't been rucked till you've been Fuddrucked." It made me giggle. We have a Fuddrucker's in our nearby town of Tualatin. I have taken the kids a few times and we love it. It is a little bit expensive but very good and fun at the same time. Never heard of Fuddrucker's, but it's always exciting to find a new favourite place to eat. Looks good! I don't know what is duckers but that picture is enough to have my mouth water. I hate getting hockey puck burgers myself. I mean cmon how hard can it be?